The kappa statistic is frequently used to test interrater reliability. The importance of rater reliability lies in the fact that it represents the extent to which the data collected in the study are correct representations of the variables measured. Measurement of the extent to which data collectors (raters) assign the same score to the same variable is called interrater reliability. While there have been a variety of methods to measure interrater reliability, traditionally it was measured as percent agreement, calculated as the number of agreement scores divided by the total number of scores. In 1960, Jacob Cohen critiqued use of percent agreement due to its inability to account for chance agreement. He introduced the Cohen’s kappa, developed to account for the possibility that raters actually guess on at least some variables due to uncertainty. Like most correlation statistics, the kappa can range from −1 to +1. While the kappa is one of the most commonly used statistics to test interrater reliability, it has limitations. Judgments about what level of kappa should be acceptable for health research are questioned. Cohen’s suggested interpretation may be too lenient for health related studies because it implies that a score as low as 0.41 might be acceptable. Kappa and percent agreement are compared, and levels for both kappa and percent agreement that should be demanded in healthcare studies are suggested. Modified Look-Locker inversion recovery (MOLLI) for high-resolution T1 mapping of the heart. A novel pulse sequence scheme is presented that allows the measurement and mapping of myocardial T1 in vivo on a 1.5 Tesla MR system within a single breath-hold. Two major modifications of conventional Look-Locker (LL) imaging are introduced: 1) selective data acquisition, and 2) merging of data from multiple LL experiments into one data set. Each modified LL inversion recovery (MOLLI) study consisted of three successive LL inversion recovery (IR) experiments with different inversion times. We acquired images in late diastole using a single-shot steady-state free-precession (SSFP) technique, combined with sensitivity encoding to achieve a data acquisition window of < 200 ms duration. We calculated T1 using signal intensities from regions of interest and pixel by pixel. T1 accuracy at different heart rates derived from simulated ECG signals was tested in phantoms. T1 estimates showed small systematic error for T1 values from 191 to 1196 ms. In vivo T1 mapping was performed in two healthy volunteers and in one patient with acute myocardial infarction before and after administration of Gd-DTPA. T1 values for myocardium and noncardiac structures were in good agreement with values available from the literature. The region of infarction was clearly visualized. MOLLI provides high-resolution T1 maps of human myocardium in native and post-contrast situations within a single breath-hold. Copyright 2004 Wiley-Liss, Inc.
Diffuse myocardial fibrosis is a final end point in most cardiac diseases. It is missed by the cardiovascular magnetic resonance (CMR) late gadolinium enhancement technique. Currently, quantifying diffuse myocardial fibrosis requires invasive biopsy, with inherent risk and sampling error. We have developed a robust and noninvasive technique, equilibrium contrast CMR (EQ-CMR) to quantify diffuse fibrosis and have validated it against the current gold standard of surgical myocardial biopsy. The 3 principles of EQ-CMR are a bolus of extracellular gadolinium contrast followed by continuous infusion to achieve equilibrium; a blood sample to measure blood volume of distribution (1-hematocrit); and CMR to measure pre- and postequilibrium T1 (with heart rate correction). The myocardial volume of distribution is calculated, reflecting diffuse myocardial fibrosis. Clinical validation occurred in patients undergoing aortic valve replacement for aortic stenosis or myectomy in hypertrophic cardiomyopathy (n=18 and n=8, respectively). Surgical biopsies were analyzed for picrosirius red fibrosis quantification on histology. The mean histological fibrosis was 20.5+/-11% in aortic stenosis and 17.1+/-7.4% in hypertrophic cardiomyopathy. EQ-CMR correlated strongly with biopsy histological fibrosis: aortic stenosis, r(2)=0.86, Kendall Tau coefficient (T)=0.71, P<0.001; hypertrophic cardiomyopathy, r(2)=0.62, T=0.52, P=0.08; combined r(2)=0.80, T=0.67, P<0.001. 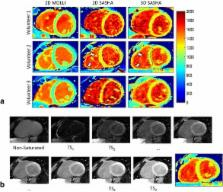 We have developed and validated a new technique, EQ-CMR, to measure diffuse myocardial fibrosis as an add-on to a standard CMR scan, which allows for the noninvasive quantification of the diffuse fibrosis burden in myocardial diseases. Intravascular functional maps of common neurovascular lesions derived from volumetric 4D CT data. Fast lipid-suppressed MR temperature mapping with echo-shifted gradient-echo imaging and spectral-spatial excitation. 3D volume-selective turbo spin echo for carotid artery wall imaging with navigator detection of swallowing.